Swapping and changing crews around has always appealed to me, particularly through the winter period when most of our training and racing is done in pairs. To put unexpected combinations together, thus levelling the playing field, is a step into the unknown and a good challenge to keep us all on our toes. It’s a chance to row with members of the team we wouldn’t usually get a chance to row with. This became reality when Jurgen decided to mix us all up and join some of the more experienced guys with the newer athletes. This is a fantastic opportunity to pass on the technique and experience we have developed over the years in the team and to learn from fresh enthusiastic young blood. I was lucky enough to be paired with Matt Tarrant, who was new to the team in 2013. Matt stroked the coxless four to fifth place last August in Korea at the World Championships. There is no doubt he is a talent, and with a gold medal from the U23 World Championships to his name he has a bright future. I was very pleased to be paired with him and despite never rowing together before, knew we could give it a good shot. We gelled well from the start and found a rhythm in which we could both sit comfortably and confidently. 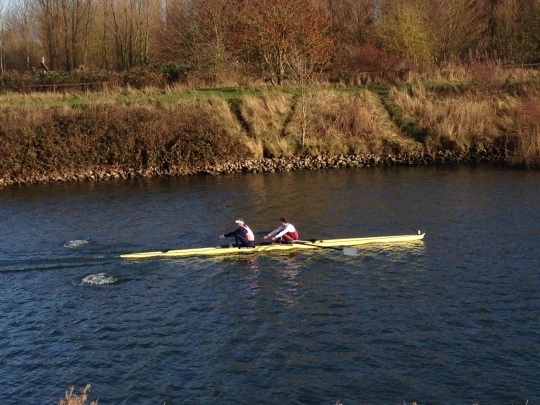 I was in the stroke seat and Matt allowed me to row my length and rhythm and adapted to my technique very quickly. It’s really important in a pair to allow each other to move freely and not force compromise. We discussed this and both agreed we were on the same page right from the start. Training consists very simply of miles – miles and miles of low intensity training – and this is what builds up our main base fitness over the course of the year. These miles on the lake at Caversham allow us to build up second nature too. They embed the feeling of the other person sitting behind or in front of you in the boat. They allow you to know without thinking what the person is going to do next, how they are going to move and react. It’s all about feel and this second nature comes from those hours together on the water. Training was going very well with Matt, we showed very good speed and with more intense pieces added to the programme, we managed to post times that placed us right at the top of the team. I tried to pass on a calm relaxed attitude, to never get flustered by anything that happens on the water and to be confident in what we were doing. This is easy to do when performances are good and times are fast. Always in my mind were the times in the past where I have done everything perfectly in training, won pieces, posted the fastest times, but when it actually came to the important race or trial someone else would beat me. This is something I have learnt to be very aware of, but not to get worried by, it’s all about performing when it really matters and using training to your advantage whether the fastest or not. I think we dealt with this really well and learnt a lot in the few weeks we were together. A Training piece at Caversham lake. We travelled up to Boston (Lincolnshire) for the dreaded 5km time trial with plenty of confidence, but never complacency. There are too many highly skilled extremely experienced athletes in the team who thrive on hurting themselves badly for a long time, which is simply what you have to do in this race. Paddling up the 5km stretch of water from Boston Rowing Club to the start line, we knew there was going to be a strong headwind to contend with in the last 3km. The water was looking and feeling rough, so we needed to save enough energy to be able to cope with that effectively. Sitting behind me in the bow seat, Matt talked us through the race as we warmed up in his typically calm, simple way and we both felt relaxed and ready on the start line. Without going into too much detail, this race hurt – badly. We started off in a great rhythm, very relaxed with a slight cross tail wind following us down the course for the first 2km. Once round the sharp corner, the wind hit, the water picked up and we were suddenly struggling, fighting our way through the waves. Matt stayed calm, sitting in my rhythm and using his power to propel the boat through the wind, ever closer to the finish line. I was concentrating on maintaining our good length of stroke despite the gusts pushing us off balance. The calls to squeeze on our rate and intensity came at the expected times from Matt and both of us with burning legs and lungs sprinted for the finish line. It felt like an appalling display of technique from me in that last 500m, but after 20 minutes of racing I just couldn’t hold my form and did anything I could to get over that line. The last agonising stroke of the Boston trial. The reports from all the other crews limping off the water were very similar, “impossible to tell how we did” or “that wind hit us hard”. It’s a huge relief to hear that others fared in a similar way to us. As the results filtered through, it came as very pleasant news that Matt and I had won, finishing three seconds ahead of the next crew. We had done enough to win the trial and put ourselves in a great position for the next few months’ training. We had worked well together, communicated honestly, in detail but without complication. We made a good partnership, we have got to know each other much better in the way we deal with situations on and off the water, the way we train and the way we race. If we find ourselves in the same crew later in the year, we will already have an advantage. This project was an excellent change to the norm and our win at trials finished it off very well. Matt Tarrant the rogue, and me, pleased with our trials win.